One of The Best Albums To Ever Be Released!! "Floyd Tillman-The Influence" Floyd's final album with special duet partners including Willie Nelson, Merle Haggard, Connie Smith, Leona Williams, Johnny Bush, Darrell McCall, Dolly Parton, Hank Thompson, Ray Price, Justin Trevino, Mel Tillis, Frankie Miller, Lawton Williams, George Jones is now available for order here through the Floyd Tillman website. Click on "The Influence" to learn more!!! Order This Historic Album Today From Heart of Texas Records! From Channel 2 Television, Floyd Tillman "I Am Music" is a DVD performance filmed in 1984 featuring Floyd's biggest hits including "I Am Music" "It Makes No Difference Now" "I'll Keep On Loving You" "Each Night At Nine" "I Love You So Much It Hurts Me" "Slippin Around" "I'll Never Slip Around Again" "I Gotta Have My Baby Back" and "This Cold War With You". 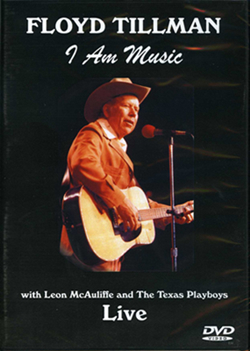 The musicians include Leon McAuliffe and the Texas Playboys including Leon Rausch, Johnny Gimble, Eldon Shamblin, Joe Frank Ferguson, Bob Boatright, Gene Gasaway and Smokey Dacus. 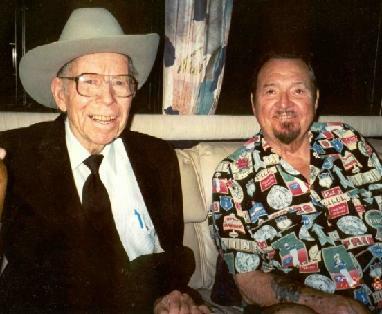 Here you will find great projects by other artists including Leona Williams, Justin Trevino, Pretty Miss Norma Jean, Darrell McCall, Ferlin Husky, Frankie Miller, Frank Torres, Dave Kirby, Curtis Potter & other Country Music! !